It has been long recognized that changes in both land and ocean biology can impact the concentration of CO2 in the atmosphere by taking up and releasing CO2. According to the current estimates, the earth?s biosphere is taking up about 50% of the human emissions of CO2. In order to understand past and future climate change, one needs to make reliable estimates of this biosphere service (the CO2 update by the biosphere) past and future. GFDL has just completed its first ESM development effort. GFDL ESMs will be used to investigate the impact of human activities on past and future climate and ecosystem changes. The observations will be used to assess the model performance. The models together with the observations will be used to detect changes in climate and ecosystems and if possible attribute those changes to specific causes. The ESMs will also be used to assess the uncertainties associated with future projections of climate and ecosystem changes. 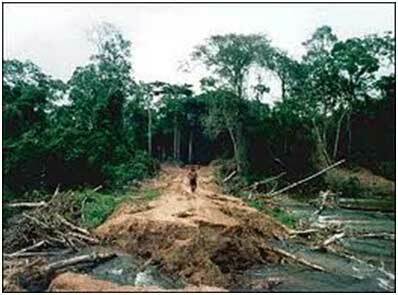 Figure: An example of logging which can impact the carbon fluxes from the land into the atmosphere.